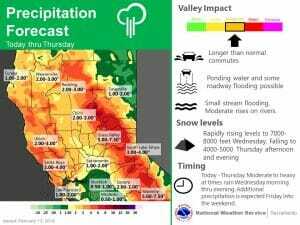 February 13, 2019 – A strong storm event will bring widespread precipitation with moderate to heavy rain and mountain snow. Local flooding with ponding on roads and rises on streams and river possible through Thursday. Periods of wet weather continue into the weekend. Moderate to heavy precipitation with the initial wave of the storm has spread across the northern half of the forecast area overnight while lighter precipitation has been falling to the south. 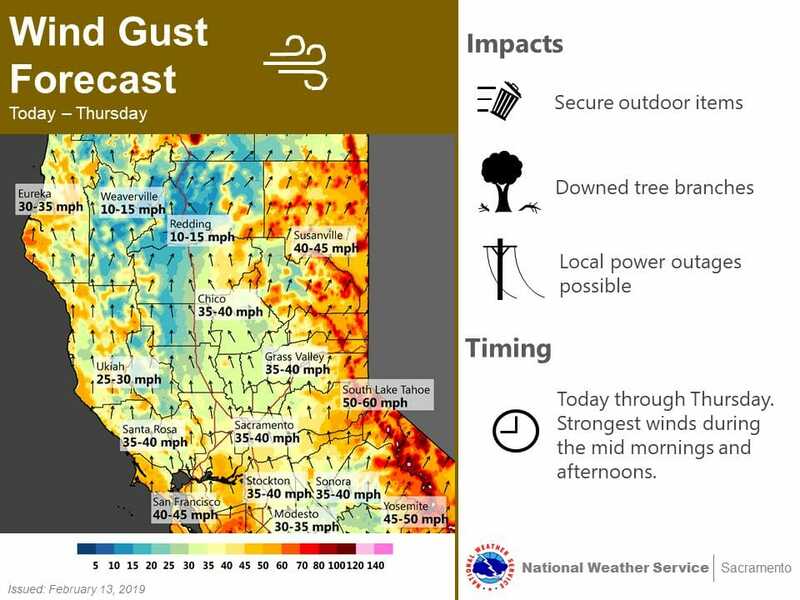 Gusty southerly winds persist especially from about I-80 southward where gusts of 35-45 mph have been rather common overnight in the foothills to the south and east of Sacramento. 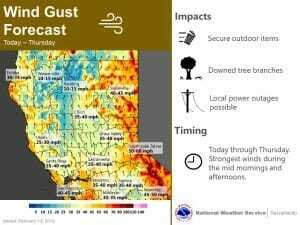 Lighter north winds have been present across the northern half of the Sacramento Valley as surface low pressure approaches from the southwest. Cold air remains entrenched across the far north end of the Sacramento Valley and northern mountains, where moderate to heavy snowfall has been occurring since Tuesday evening, while warmer air has been rapidly moving in across the remainder of the region with snow level radars indicating snow levels above 8-9k feet. Snow has just switched over to rain at KBLU, but the transition will be slower across Shasta County where warming of the sounding from the top down may lift snow levels a bit by later this morning and this afternoon. The remaining cold air should be mixed out of the northern mountains later tonight and early Thursday as next surface low races northward off the coast up into western Oregon by midday Thursday. This will also bring another upswing in precipitation and gusty southerly winds as gradients tighten to around 15 mbs from SAC to MFR bringing an elevated risk for power outages and tree damage. 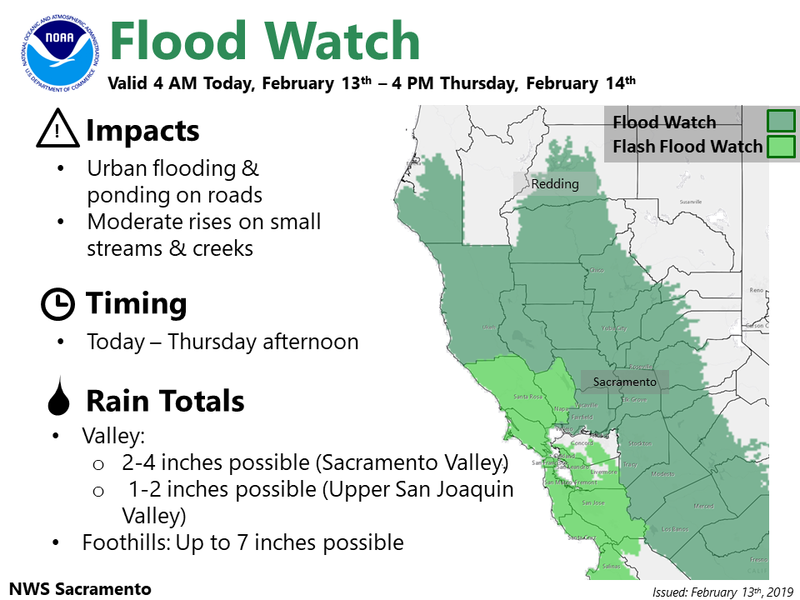 This will also be the period where there will increased potential for any flooding issues as runoff from the ongoing precipitation is enhanced by low-elevation snow melt. Snow levels expected to come back down Thursday afternoon and night as the next cold upper low drops down to off the coast of Oregon and displaces the milder airmass to the east. 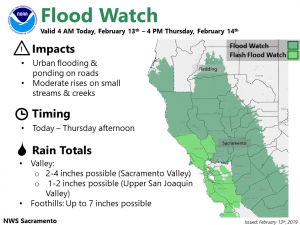 At the same time, snowfall will increase over the northern Sierra Thursday night as lapse rates steepen and upslope component to the flow increases. A few thunderstorms will be possible in the Central Valley. Wet and cooler pattern will continue into the weekend as several disturbances drop down from the northwest bringing showers and adding to the snowpack in the mountains. An upper trough will be moving across the west coast Sunday into Monday bringing continued precipitation chances to NorCal. Light valley rain remains possible on Sunday, although the better chances for precipitation look to be over the mountain and foothill regions. Additional snow accumulations of around six inches may be possible Sunday and Sunday night with snow levels as low as 1500 feet Sunday afternoon, falling to around 1000 feet Sunday night. Minor travel impacts are possible this day. Dry weather returns Monday night and Tuesday, with another system possible mid next week. Cold low temperatures will be seen early next week.